This article appeared in The Morning Call of the Lehigh Valley, Allentown-Bethlehem-Easton Pennsylvania area. It featured a dental implant procedure which permanently replaces all of the missing teeth in one day, called the Branemark Novum System. These teeth stay in and feel like natural teeth. Periodontist Scott Gradwell of Allentown shows a lower-jaw dental implant similar to one implanted in a patient's mouth. This model shows the bar that holds posts implanted into the jaw. Joann Engler laughs a little as Dr. Serge John Salivonchik Jr. positions himself over her open mouth holding a tiny wrench between his fingers. 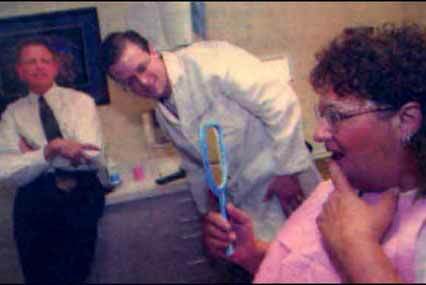 “Okay, let’s tune you up,” says the Whitehall Township dentist. “Gee, I sound like a car,” she quips. Indeed, if Engler’s new dental work were a car, it would be a Porche. Or perhaps a high-end Volvo, inasmuch as the high-tech dental appliance the New Smithsville woman received last month is the latest in Swedish engineering. It’s called the Branemark Novum dental implant system, and, at $12,000 to $15,000, it could cost a patient such as Engler about as much as a Volvo, albeit a used one. Still, the new alternative to removable dentures or conventional tooth implants is winning raves among dental practitioners, who say that for some patients, it can lead to a well-functioning, natural-feeling set of lower teeth for the first time in years. “It’s something we’re really excited about because it has the ability to improve many people’s lives,” says Salivonchik. Salivonchik and his colleague, periodontist Dr. Scott Gradwell of Allentown, say Engler, 51, is the first patient they know of to have the Novum implant procedure in the Lehigh Valley. They provided their services to her at cost as a way of trying out the new technique. Drs. Mark Grim and Laurence Popovich of Valley Oral Surgery of Allentown and Bethlehem also began using the Novum system last month. They did their first implant case June 11. Periodontist Scott Gradwell (left) and Dr. Serge John Salivonchik Jr. are delighted that their first dental implant plate fits patient Joann Engler of New Smithsville perfectly. Engler has a look for herself with a mirror. 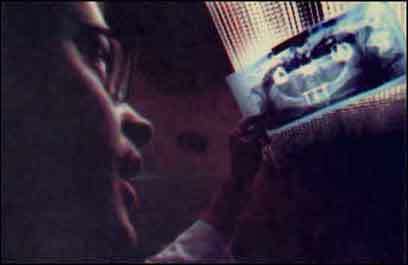 Dr. Serge John Salivonchik Jr. looks at an X-ray of a dental implant that was implanted in one of his patient's mouths. Developed during the last decade by Dr. Per-Ingvar Branemark of Goteborg University in Sweden, the new implant techinque has been formally studied only in a limited number of people. The system has been used in the United States for about a year and available in practices for about six months. How it will perform over decades is still somewhat of an open question. But a study of 50 patients done by the system’s developers found no failures of the implants in more than 90 percent of patients. Nearly 95 percent reported no undue discomfort during the work and said they would recommend the technique to others. Popowich says he has confidence in the new system because Branemark was a developer of conventional dental implants, which have had an excellent success record over many years. “He’s an orthopedic surgeon who really revolutionized the dental world. With Dr. Branemark having done the initial work, we feel the integrity of the system is going to be fantastic. We’ve seen data out of Sweden, and we expect similar results,” Popowich says. Still, local practitioners point out that the Branemark system is not for everyone who needs replacement teeth. 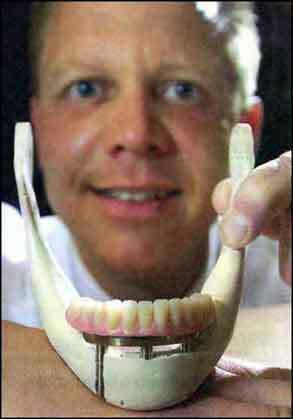 Right now, the system is used only for those who need a full set of teeth for their lower jaw, called the mandible. Because of a less-sturdy bone structure in the upper jaw and the complexities of the nasal and sinus cavities that lie nearby, the implants are not considered appropriate for replacing upper teeth, although work in that direction is under way. Nonetheless, dentists who have learned the Novum system say they like it because it uses prefabricated, precision components that standardize many aspects of fitting a patient with implants and cut the time he or she must spend in the chair. After measurements are made, sometimes with the help of a specialist called a prosthodontist, the bulk of the work can be done in as little as a couple of days, they say. Richard Miller of Allentown, who underwent the procedure with Drs. Grim and Popowich, had his new teeth the day after surgery, even though he, unlike Engler, needed to have five or six teeth extracted at the same time the implant posts were placed. The technological centerpiece of the new technique is a titanium stabilizing bar that fits both on top of the titanium implant posts placed in the patient’s lower jawbone and into another bar fitted across the bottom of the gum-colored bridge holding the replacement teeth. Because of the design, patients require fewer implant posts – just three instead of six or seven for an entire lower jaw. Patient Joann Engler of New Smithsville, left, shows the finished product - a new bottom dental implant and her regular upper teeth. The bar assembly keeps the posts from moving even a fraction or an inch as they incorporate solidly into the jawbone. That means the new teeth can be placed quickly, instead of the dentist needing to sew up the incisions in the gum and letting the implants “rest”. As a result, patients need not go without teeth for 3 to 6 months while the implant sites heal, as would be necessary with conventional implants. “We’re able to put teeth in sooner rather than later,” says Salivonchik. The bars, to the implant posts themselves, take the stress, he says. Titanium, the metal used for the posts and bars, has an excellent record for strength and durability, as well as not being rejected by the body, Grim notes, saying it has been used in conventional dental implants for the last 20 to 30 years and also in joint-replacement devices. Still, the surgery can be grueling, taking from 2 ½ to more than 4 hours. Using a specially designed suite of tools and templates, the dental surgeon cuts open the top gum and shaves down the top surface of the jawbone to make it a flat platform for the bar, as well as drills holes more than an inch deep in the jawbone for the posts. Patients are sedated for the procedure. After the posts are installed, a soft material is fitted over the top of them until the teeth are placed so there are no jagged edges. The placement of the bridge with the new teeth requires only a few minutes, with the dentist using a tiny wrench to tighten the screws holding the new teeth to the implant posts. Within minutes of having her new teeth tightened by Salivonchik, Engler was happily eating a vanilla soft ice cream cone. She was told by her dentists to eat a soft diet and avoid chewing anything hard, including crusty bread, for about three months. Patients generally are asked to return a week after their teeth are placed and monthly for the first six months. 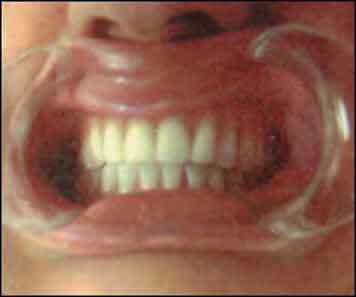 Patients can’t remove the teeth on their own, but return every six months for professional cleaning. In between, they brush the implants like regular teeth. “People always ask, ‘What about going through metal detectors in airports?’ Well, it doesn’t set them off,” Gradwell says of the titanium appliance. He adds that patients also need not worry about the metal disqualifying them from magnetic resonance imaging, or MRI testing. For Engler, the placement of her new teeth was the first she had functioning teeth in her lower jaw for 17 years. A dentist had fitted her with a lower denture about a decade ago, she says, but it never fit right and she gave up wearing it because it made her gums sore. She also developed severe pain in her jaw hinge from eating without teeth.